The very best words on forgiveness when up against crushing, debilitating feelings of sin and unworthiness are the Psalms. The Gospels tell of what Jesus said and did but the Psalms tell us how he FELT! Yes, there’s nothing like the Psalms for wounded sinners. Believe me, I know as one myself. But sometimes other words speak to us almost as powerfully. At UCLA English class forty years after my early undergraduate work, I got to formally study once again the religious poetry of the talented Anglican Dean of St. Paul’s, John Donne (1571-1631), and the English country parson George Herbert (1593-1633). It is Herbert’s poem Love III, however, that I find revealing of an acute, intelligent reflection on the doctrine of grace – the fact that God will forgive us and, beyond that, accept us. This one poem has helped me and my congregations through the years see the exquisite intimacy of the God-child relationship and the sense of creatureliness and alienation we feel when we need forgiveness. Perhaps it can help you. At such times feelings are all-important for negative emotions can conspire to sever the bond between creature and Creator and plunge us into the Lower Hell of abandonment and hopelessness. But Luther won through to full assurance. So can you and I. Herbert’s simple-seeming yet deeply spiritual meditation offer an antidote to the depression and unworthiness that Christians experience after sinful encounters. Here is my commentary – stripped of some of the class paper terminology. Herbert was an English aristocrat, a respected leader at Oxford University, a dissenter from the politics and war of the day. In a compressed and thrilling metaphor of the Banquet analogy (one of Jesus’ favorites – see Revelation 3:20) he communicated his real-world country parson’s understanding of God’s forgiveness. Herbert knew his Bible well. 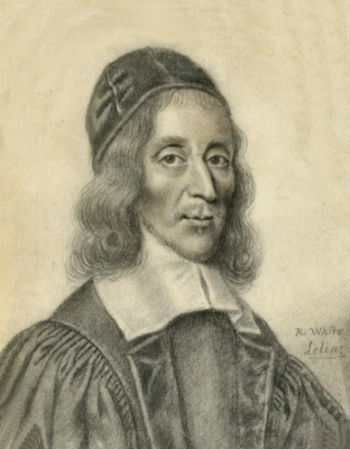 According to one source it was the poet/parson’s practice to read two Psalms daily and to join in an ongoing communal group reading of the entire book of Psalms (George N. Wall, George Herbert: The Country Parson, The Temple). Yet Herbert, as hard as he tried, was no stranger to “dusty sin.” Sin and guilt tell us “I’m unworthy to enter his presence let alone enjoy a divinely-prepared love feast.” The guest feels unworthy and must shy away from the Invitation. Yet each argument is met with a better, more elegant and gentle intelligent response – Grace in action! “Who made the eyes but I?” is a gentle rhyme yet powerful at this point. It begins to turn the corner for the distraught guest. It again confirms who the Host really is – our kind and compassionate Creator who, said the Psalmist, knows us better than ourselves (Psalm 103:8-14). The implied term “Host” here is important. Some think Herbert, as an Anglican minister, is implying a double-edged reference to the Communion bread, or Host, as some churches call it. That may be so, an example of the elastic suggestiveness of religious poetry at its best. Eyes marred with sin? Yes. Which Christian repenter has not felt that sting of conscience and the fear that, finally, this time, all is lost? The final word picture depicts almost everything warm, kind and inviting to the wounded and the penitent soul – true Communion at last. Home again! Nothing could be more calculated to spell Assurance than sharing a meal with one’s Creator-Redeemer. In the guise of a patient, loving Host, God invites communion with sinners. The banquet here referenced is in the Biblical mode of Jacob eating with Laban, the elders of Israel eating and drinking with the Lord God on Mt. Sinai, Jesus breaking bread at the Lord’s Supper and the gracious Host knocking at the door in Revelation 3. It has been well-said that in ancient Middle Eastern cultures, whom you ate with was more important than who slept with. The sharing of food here represents the triumph of grace hard-won after real and remorseful repentance. Herbert’s message? Even dusty sinners can expect restitution at the hands of a God who has provided both the incentive and the mechanism for forgiveness of past wrongs. With such a Host sinners need have no fear. God will forgive us. 1. Joan Bennett, Five Metaphysical Poets (Cambridge: CUP, 1964), page 3. 2. Helen Gardner, John Donne: The Divine Poems (Oxford: Clarendon Press, 1952), page xxxi.